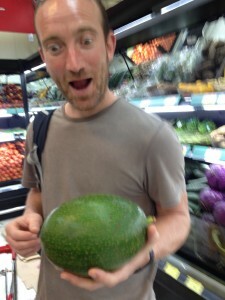 Another thing about avocados in Colombia is that the stall holders aren’t the quietest of people. 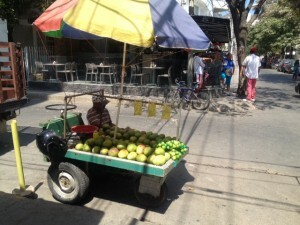 They walk past the apartment blocks and houses pushing their wheelbarrows and shouting, sometimes through a megaphone, trying to get people to come and buy their fruit and vegetables. 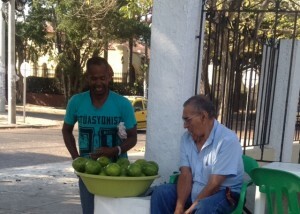 They talk really quick, telling you all the things they are selling and it sounds quite funny. 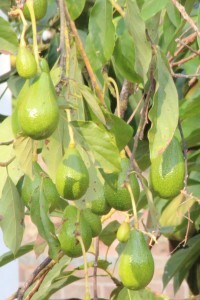 In case you don’t already know avocados grow on trees and we walk past them very often. You can tell that we have got used to them because when we went to Don Diego, Brae and I used some to play catch because we didn’t have a ball! 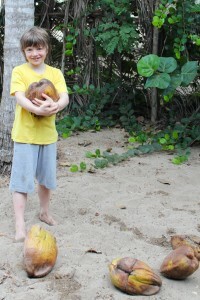 In my last post about a coconut, I told you that we managed to open one in Palomino by smashing it with a stick. It took me, my dad and Brae about 30 minutes to get it open. 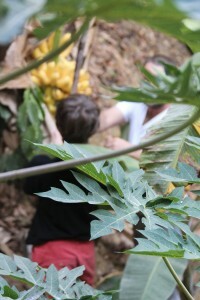 But this weekend, in Parque Tayrona, we found out the real way to open coconuts. 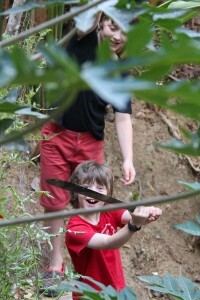 We were walking along the jungle path after a swim, when we saw a man hacking skillfully at a coconut case with a machete by the side of the jungle path. He saw us watching him and my mum told him the story about how we opened a coconut with a stick, and she said we were pleased to see what the real way to open a coconut was. We think he was going to drink the coconut milk because he was thirsty. It was a really hot day and he was doing hard work fixing a fence and he didn’t have anything else to drink. 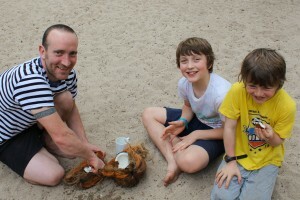 But because we were watching him he asked if we wanted the coconut he’d just opened, to drink it ourselves! 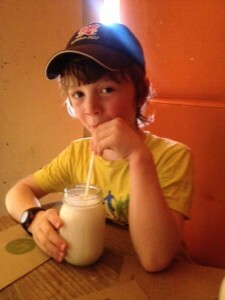 We tried the milk and it was delicious and refreshing. We tried to offer him some but he said we could have it all. After we had drunk it he chopped the case up some more and gave each of us a quarter and let us eat it! My Mum also took a video of him chopping. It was really nice of him to give it to us, but we weren’t as surprised as we would have been in England as we have found that Colombian people are really nice and kind. 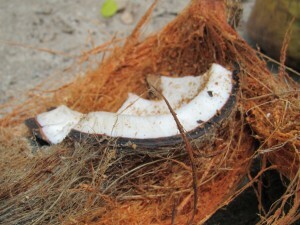 To see the previous post of story of a coconut see here. Even though we’ve already explained to you about some great things we did in Minca, we have not told you about all of it yet. There was too much fun stuff to tell you in only one go, so here are a few other things we did there that we haven’t mentioned yet. 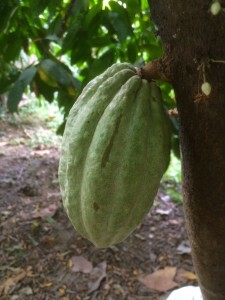 In Colombia, it is so hot that you can grow things that you can’t grow in England, like chocolate! When we were in Minca we went to have lunch one day. It was kind of a restaurant but it was really just two small tables in the garden of someone’s house in the middle of nowhere. We had some yummy food that the family who lived there made and we bought a necklace, to give to our little cousin, that the daughter of the family had made out of clay. 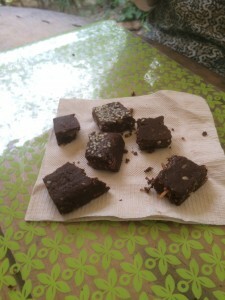 For pudding we had some fresh chocolate and the lady showed us that it grew from her cocoa tree in the back garden. The case of the chocolate (called a cocoa pod) is green instead of brown like I imagined it. Here is a picture of one if you do not believe me. 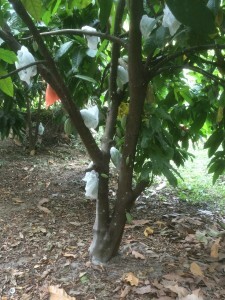 The chocolate tree had bags over the pods so the squirrels did not eat them. Another thing I remember from Minca is when we were finishing one of our tours Niall said he knew a nice place for lunch and our minds changed to a nice air conditioned room with walls to escape the boiling temperature. We were all taken by a big surprise when we arrived. We were staring at a little shelter with no walls. There were four wooden tables with wooden benches, and one of the tables had huge chunks of ribs laid across it. There was no proper bathroom as it was just a bucket of water for washing your hands. Also, there was a little oven made of bricks with all sorts of meat being cooked. The floor was just made of mud and lots of stray chickens, dogs and cats were wandering around all over the place. 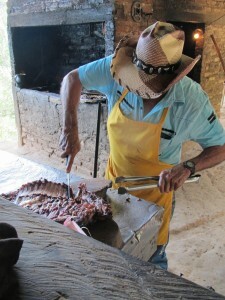 The owner was really nice and he started to cut up the cooked ribs and said we were allowed to try some for free! It was really tasty so I had some ribs just like that for lunch as I liked it so much. As you can see, restaurants in Colombia are very different to ones in England! But we had a really nice meal with Niall and our new friends Sarah, John, Karen and Darren and they had beer and fizzy drinks too so everyone was happy. 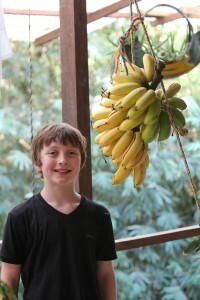 we were looking out of our balcony and in the distance my mum and dad were quite surprised to see Oren wielding a machete around, cutting off a bunch of bananas. Most grown ups don’t give you a massive machete and ask you to chop through the jungle but Niall isn’t like a normal boring grown up! Of course I thought it looked fun so I ran out there to have a go too! So you can tell how many amazing memories we have of Minca, so you might not be surprised that before we go back to England, we would really like to go back there and do another tour with Niall where you cover yourself in mud and wash it off in a waterfall. So this might not be last you hear about Minca so stand by! 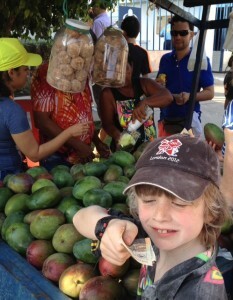 You can buy fruit in the supermarket here but we have discovered that lots of people people sell fruit at the side of the road on little wheelbarrows or stalls made out of wooden boxes. Sometimes people only have one kind of fruit (which makes me think that maybe they only have one fruit tree in their garden and that’s the only fruit they can sell), but sometimes they have a whole variety. 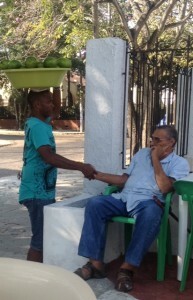 In these photos the man is selling avocados and he was carrying them on his head. 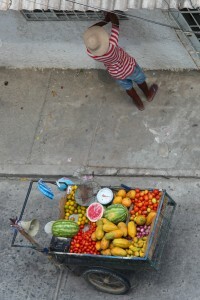 Sometimes from our balcony we hear the sellers shouting through a loud speaker: ‘AGUACATE, AGUACATE, AGUACATE, PAPAYA, PAPAYA, PAPAYA’ (‘Avocado…papaya…’) to get people to come out of their apartments and buy them. take a picture. 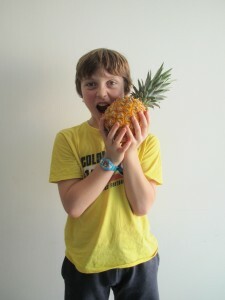 We have eaten LOTS more golden pineapple since the first one so here is a photo of one we had last week. 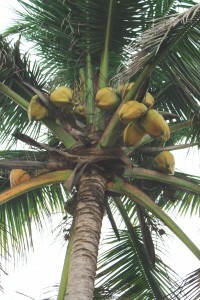 If you’ve ever eaten a coconut you might think it grows like that. 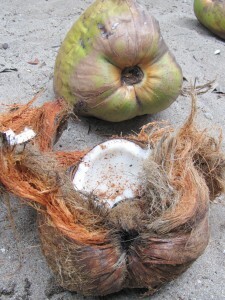 But really, in the palm tree, a coconut grows inside a big, green case and it falls to the ground when it is ready. 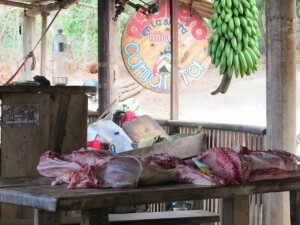 In Colombia you can find lots of different foods that you can find nowhere in England. 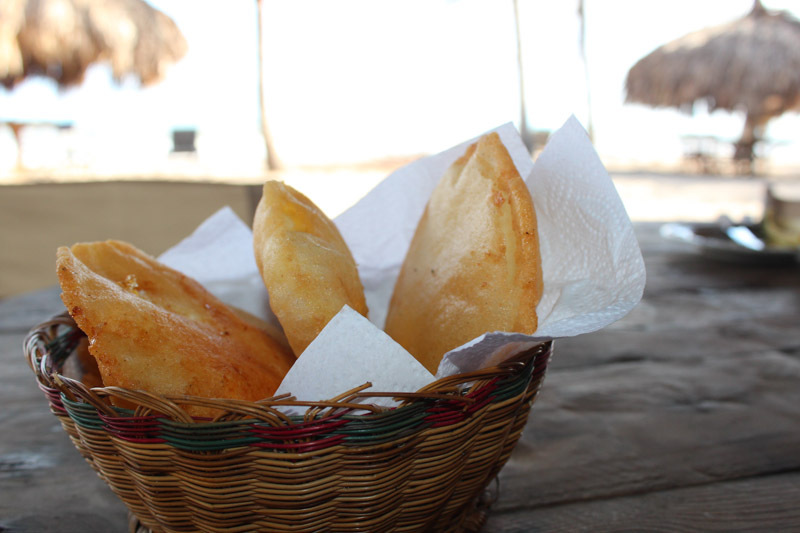 For example ‘arepas’ are a sort of pancake that you can put lots of stuff on like meat or cheese. 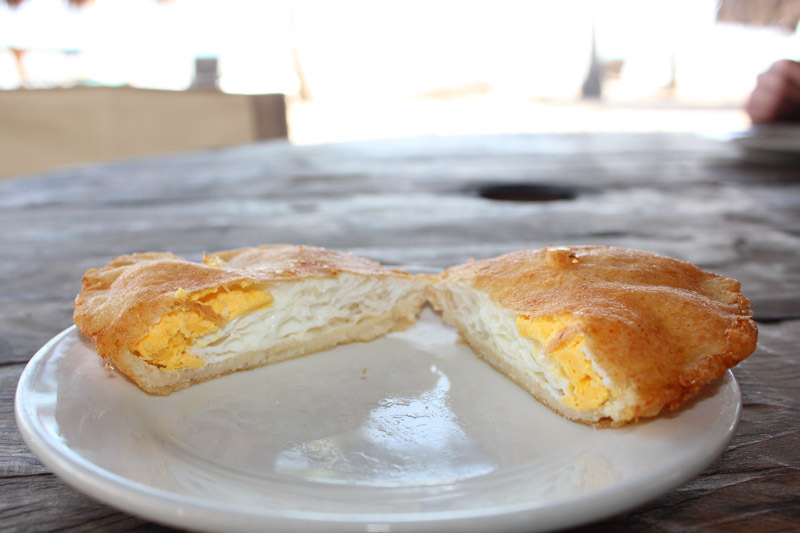 My favouite one so far is ‘arepa de huevo’ (with egg inside). I had it for breakfast one day. I don’t know how they get the egg inside. Here are two pictures of it. Another Colombian food that I really like is ‘patacones’ which is like a pancake made from a kind of big banana that they grow here. In Colombia they use these bananas like potatoes – they cook them in lots of different ways in the main course of your dinner, not your pudding. They roast it, they fry it like chips and they mash it into ‘patacones’. We have seen lots of farms growing bananas but we don’t think they grow potatoes here. Colombian food is very tasty and I am enjoying trying new things. Last night I tried the ‘tomate de arbol’ (tamarillo) I mentioned in my blog entry yesterday, and it was disgusting! Luckily I had some plum to get rid of the taste. So, this brings me to my first ‘Thing I have discovered in Colombia’ (I am sure there will be lots more facts to come in other posts). 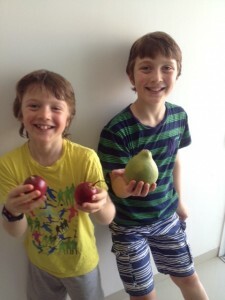 Fact 1: not all tropical fruits are tasty (although most are).